Dr Ranger is chairman and founder of the export company, Sun Mark Ltd – which he started in the 1970's with just £2, a typewriter, a car and a self-storage unit. Sun Mark is now the only company to have ever won the Queen's Awards for Enterprise for International Trade five times in a row and Dr Ranger himself was named Institute of Directors' Director of the Year in 2013. The generous gift to LSBU will be used to set up a fund for enterprise excellence in Dr Ranger's name to support student entrepreneurship activities at the university. In addition, LSBU will establish the Dr Rami Ranger MBE Centre for Graduate Entrepreneurship, which will provide a hub and workspace for students and graduates on enterprise programmes. London South Bank University hosted a reception for Dr Ranger on Friday 3 October with guests including the Rt Hon Theresa Villiers MP, who has been Secretary of State for Northern Ireland since 2012. 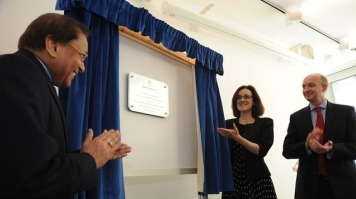 Ms Villiers and Dr Ranger unveiled a plaque that officially marked the beginning of the new partnership, which the Secretary of State praised by saying: "I am sure that the work that will be done here will benefit the students by giving them the important skills that they will need. It is a great project and I would like to congratulate Rami Ranger and London South Bank University." In a speech to the guests, Dr Ranger said: "I am humbled to have this opportunity to speak to you about two subjects that have been so critical to my success – education and entrepreneurship. "Where I am today is a far cry from where I started. Education enriched and shaped the futures of myself and my siblings. I started with nothing and now have the opportunity to help others make the most of their lives. Dr Ranger added that he chose London South Bank University because of the diversity of students. "So many different cultures, colours, religions are working here. This is the ideal place for me, as an immigrant to come here and show other immigrants that success is possible. Britain is a land of great opportunities and with the five golden principles; self-respect, work ethic, commitment, vision and empathy, everything is possible." Dr Ranger made special mention of his late mother for her emphasis to education and to his wife for her support. He said that he hoped the new centre would empower people through education and enable them to free their imaginations and that would play a part in making their aspirations come to fruition. He further added that he hoped other entrepreneurs would follow suit and support our educational institutions. Both Mr Stephen Pound MP and Mr Richard Harrington MP praised Dr Ranger for his work in both the fields of business and for social causes at the reception. LSBU Vice Chancellor Professor David Phoenix added: "The University thanks Dr Rami Ranger for his generous donation to support our enterprise activities. His entrepreneurial spirit is shared by LSBU and is something we embed in our own ethos by building real world experience into every aspect of our curriculum, nurturing the student's confidence and self-belief – the very strength that has helped to make Rami Ranger the success he is today."